When a recipe calls for cooked chicken or turkey, it's great to have leftovers on hand. But when you don't, it's easy enough to poach turkey or chicken to use. 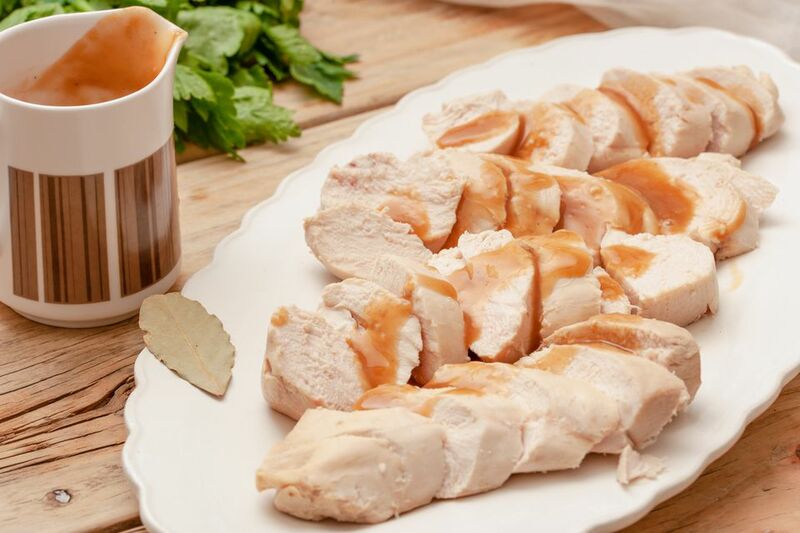 Poaching yields a tender texture and moist chicken or turkey. Use this cooked poultry in sandwiches, salads, chili, pot pie and more. Be sure to strain the flavorful cooking liquid and save it to use any time a recipe calls for chicken stock or broth–it can be frozen in a zip-top bag or a freezer-safe container. In fact, this recipe is particularly useful for making pot pie: poach the chicken in the broth, then use the flavorful broth to make the gravy for the pot pie. You can also enrich the flavor of your chicken and broth by adding other ingredients you may have on hand. A few sprigs of thyme, some lemon wedges or some whole peppercorns would add freshness and complexity. Or, consider sliced ginger, scallions, a piece of kombu seaweed and a splash of soy sauce in the broth to give the chicken a more Asian flavor profile. Place the chicken or turkey breast in a single layer in a large, heavy-bottomed pot such as a Dutch oven. Add the onion and celery, then pour stock over the vegetables and poultry. Submerge the bay leaf in the stock. Cover, bring to a boil, then reduce heat to low and simmer with the cover on, for 15 to 20 minutes, or until internal temperature of meat is 165 F.
Remove from heat, remove the poultry with tongs and strain stock into a bowl. Serve and enjoy with your favorite gravy.